President Obama’s middling job approval rating has been quite steady over the last few months, devoid of much movement outside of the relatively subtle shifts seen from poll to poll. 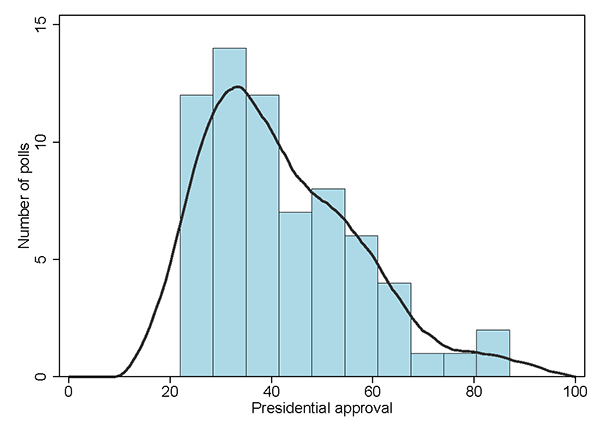 This is nothing new: Based on Gallup’s polling, Barack Obama’s approval rating has the smallest standard deviation of any modern president. That is, Americans’ view of his job performance has seen the least variation of any president going back to Harry Truman. 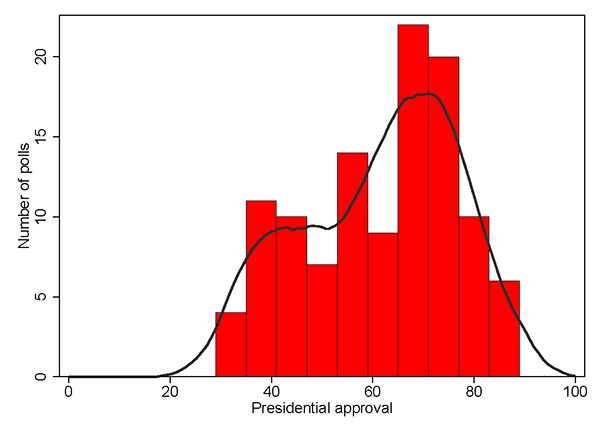 If it seems like Obama’s job approval is basically static, that’s because it is. 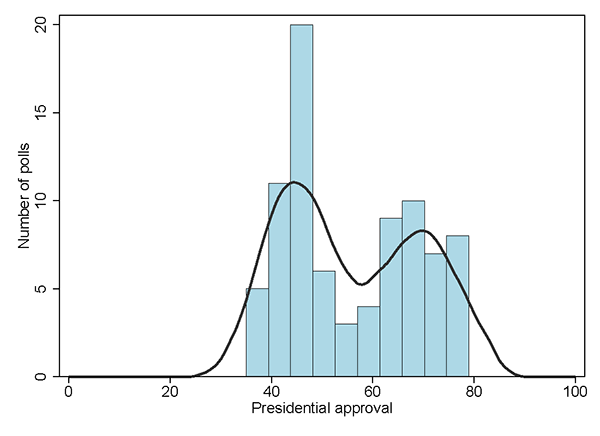 Standard deviation is a statistical measure that calculates the distance from the mean (the average) of all observations (in this case, all job approval polls). A small standard deviation indicates that more observations are found relatively close to the mean; a larger standard deviation indicates that the observations are more widely dispersed. 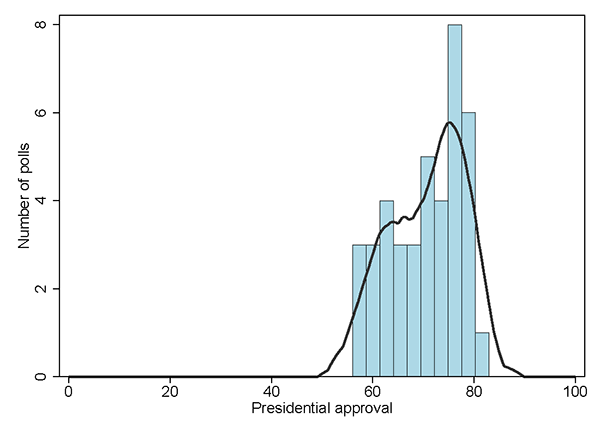 Whereas some previous presidents have scaled great heights and fallen to remarkable lows, Obama has mostly remained somewhere between the mid-to-high 40% range for most of his presidency. 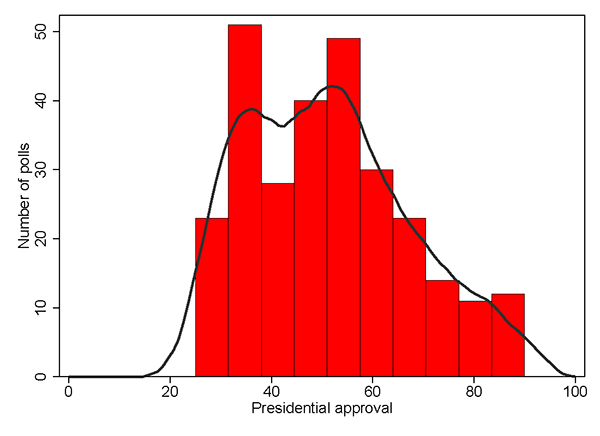 In fact, Obama’s middle 50% of poll results (the second and third quartiles) range from 44% to 50%. 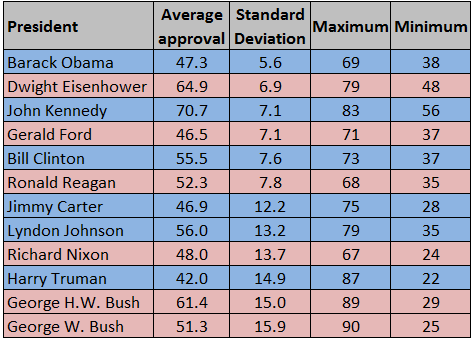 Table 1 lays out average approval and standard deviation of Obama and other modern presidents, as well as the maximum and minimum levels of approval each had. Source: Gallup Presidential Approval Center for Harry Truman through George W. Bush, Gallup three-day rolling averages for Barack Obama. 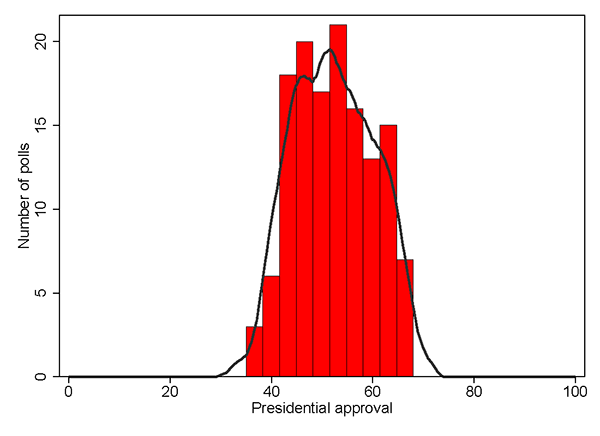 Note: Obama approval data through Tuesday, Sept. 15, 2015. Gallup also polled during Franklin Roosevelt’s presidency, but FDR is not included because those surveys did not cover his entire presidency. In terms of raw difference between maximum and minimum observations, only John Kennedy had a smaller gap (27 points) than Obama (31 points, same as Dwight Eisenhower). 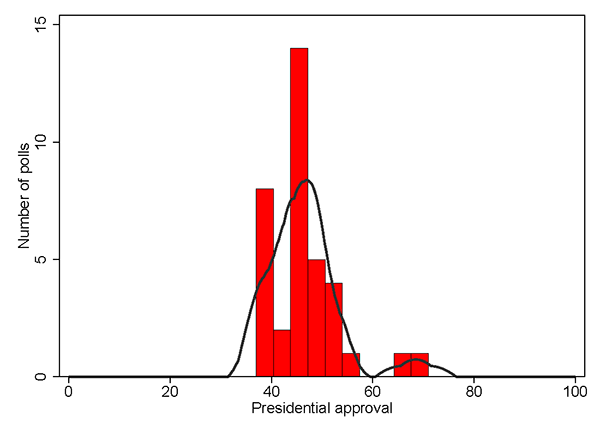 But as shown in the histogram in Chart 1, Obama had few polls that found him above 60% in approval but also few below 40%. After July 2009 during his first year in office, his approval rating has never gone back above 60%, while he has occasionally dropped below 40%, mostly in the late summer and early fall of 2011. Of course, with daily updated three-day tracking polls from Gallup, we have an incredible trove of approval data for Obama — over 2,300 observations at this point. Unfortunately, polling was less extensive back in the day. 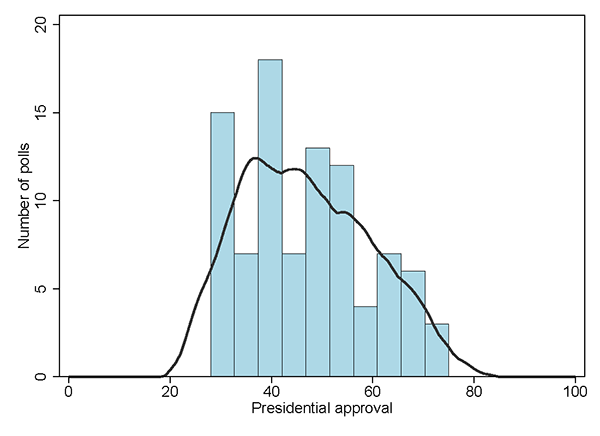 With weeks and sometimes months between polls in previous decades, it’s at least possible that more surveys might have moved the numbers for some presidents with small batches of polls, such as Kennedy (40 surveys) and/or Gerald Ford (36). 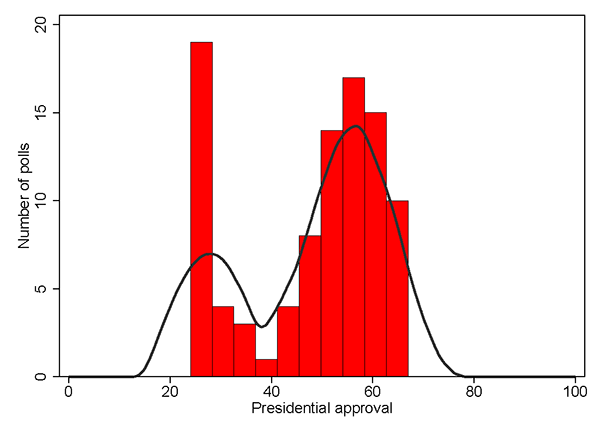 If enough additional surveys had found their approval ratings to be relatively close to their respective means, their standard deviations would be lower. 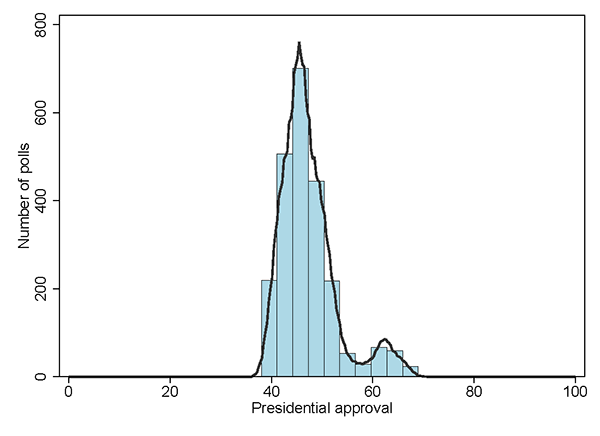 Nonetheless, given the sizable difference in standard deviation between Obama and the next closest president, Eisenhower, it seems quite possible that we are witnessing the most stable, least volatile period of the public’s opinion about a president in modern American history. What a strange juxtaposition to the wild electoral swings of recent times and the sometimes chaotic and ugly developments in the nation’s capital. While this piece does not seek to answer the exact reasons for this relative stasis, an obvious influence could be the incredible levels of political polarization we see in American political life today. As the political scientists behind voteview.com and their commonly-used DW-NOMINATE vote-scoring system have found, Congress today is possibly the most polarized it’s ever been. And as Crystal Ball senior columnist Alan Abramowitz has argued, Americans are just as polarized as the politicians they’ve elected to represent them in Washington, DC. Considering what has greatly impacted past presidents’ approval, the absence of a serious economic crisis (Obama entered office in the midst of the Great Recession and has served as the economy has improved) and a major overseas commitment of American military forces in an unpopular conflict are also factors worth noting, as is the lack of a rally-around-the-flag moment such as the days and months following the Sept. 11, 2001 attacks. 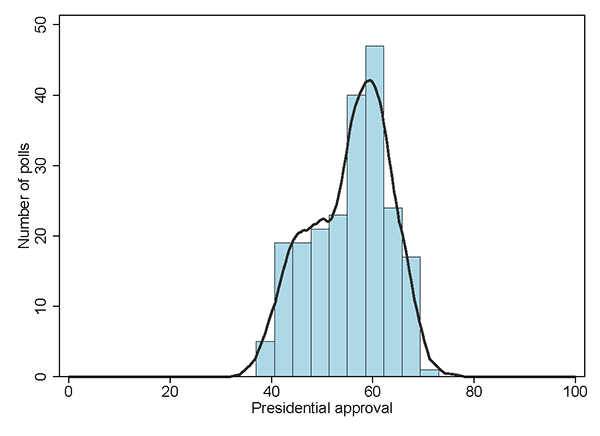 Laid out below are histograms of every other modern president’s Gallup approval polling, along with a smoothed line over each data set. Observe just how widely dispersed some of the polling results are for many presidents and recall the conflicts, crises, successes, and scandals that led Americans to sometimes strongly approve or disapprove of a president. One final note: Franklin Roosevelt was not included in this analysis because Gallup did not begin asking the job approval question more-or-less as we know it until 1937 during FDR’s second term. Therefore, we began with Truman as he is the first president to have job approval data for the entirety of his time in office. 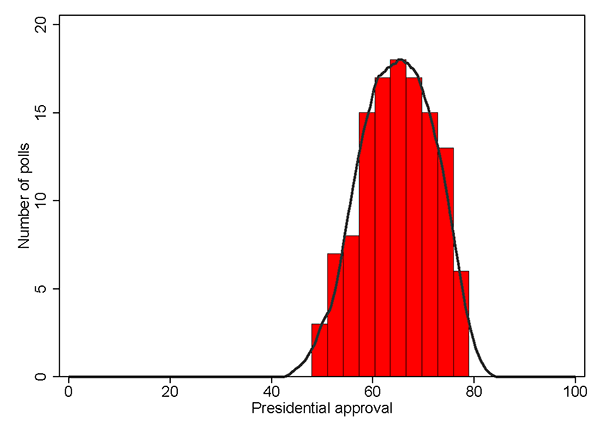 Of the data available for Roosevelt, his approval polling standard deviation was 9.1.